You might believe that it somehow gets easier — or requires less time — to market your business as your online presence grows. Instead, you switch from working your tail off to get known to working your tail off to keep up with being known. Even if you stairstep the number of platforms, channels, and methods you use, there comes a point in which you just can’t keep up with it by yourself, let alone continue to grow into new areas. The only options are to embrace the marketing ceiling or start delegating some of the marketing work. Let’s get real here: the hard part of content marketing is generating content that showcases your experience, expertise, and personality. On top of that, it should be some mix of useful, entertaining, or inspiring for your audience. 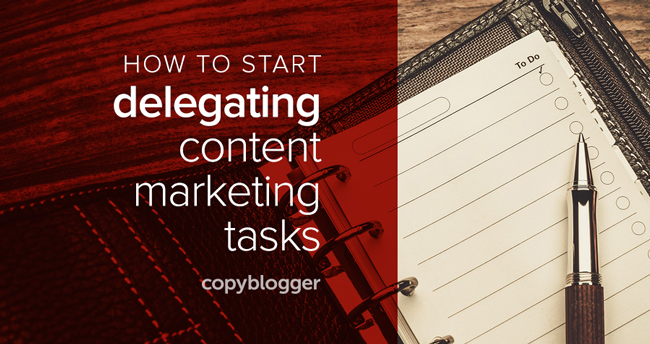 When delegating content generation, from a cost and efficacy perspective it’s often best to start with delegating parts of content marketing tasks and projects. The major upshot of partial delegation workflows is that you can start today because they’re easy to implement. The more you embrace the delegation habit and free up your bandwidth, the more you can focus on your high value activities. Don’t delegate to save time; delegate to spend more time on your high value activities. In the rest of the post, I’m going to apply the partial delegation concept to the content marketing activities you’re likely already doing. I’m intentionally providing ideas other than content generation to highlight easier places you can start, without hiring or training other content marketers. This will take your social media scheduling to the next level simply because all the clicking required to do this yourself takes time away from focused thinking. Scheduling social media updates can take as much time as generating the updates themselves. Delegating the scheduling means you focus on creating the value, and someone else focuses on delivering the value. People use hashtags to find and filter the content and people they want to follow. They’re likely using different hashtags than you, as the expert, would think to use. Keep your focus on content generation while someone else does the research on the hashtags people use. This will help you with delegating the first social media workflow, too, as you’ll now be able to use your hashtag list when you post social media updates, so that your updates get found. How many times have you noticed that an influencer has followed you or shared your content long after the fact? Or that there’s a true fan who shares everything you do who might love a personal thank you? Having someone else monitor your streams and notify you about these events will ensure you’re not missing prime opportunities to connect and engage. Once you get this workflow going and someone else formats your blog posts and pages for you, you can write in whatever app or program works for you, including email. When I notice that I’m writing an email to a reader or client that should be a post, I’ll often bcc someone else on my team so that the information doesn’t become trapped content. My best posts almost always start from a conversation I’ve already had with someone. Keeping cornerstone pages current often remains a “when I get to it” affair. Someone else can review your cornerstone content on a regular basis and propose adding new, relevant content to the appropriate pages. You’ve done the work to create them, so keep them updated, because sending hundreds or thousands of people to an out-of-date page isn’t exactly putting your best foot forward. When you share a pingback to your content on social media, you have an opportunity to thank someone and build social proof for your content. Set up an email filter or rule so that pingbacks go to a team member you assign. That person can then either automatically send it out via social media or draft an update to send to you for approval. We’ve all sent out the fugly email broadcast with a broken link or glaring typo. Email broadcasts are particularly troublesome because once you send them out, you can’t change them. On the other hand, fiddling with emails to make them just right is displacing more important work you could be doing. Hand this workflow to someone else to prevent errors and give you more time to work on content generation. If your email broadcasts tend to be the same format every time, you have a de facto template on your hands. Moving that template to a collaborative doc that a team member can prefill for you makes your life a lot easier. Team members can put in mentions, pingbacks, testimonials that have happened since your last email broadcast so you don’t have to remember to do so. You can also have that person remind you to promote whatever’s on deck so you don’t send out the broadcast and then remember that you were supposed to promote something. Your mileage and need may vary with this one depending on the email marketing service you’re using, as some have robust analytics tools and others leave you flying blind. Having someone keep up with your open, click-through, and unsubscribe rates for your autoresponders can ensure you’re neither overdosing on stat crack nor simply hoping that your email marketing strategy is working for you. Good content marketers create good content; great content marketers iterate on the content they’ve already created. Make being the latter easier by turning over the responsibility to update and report on trends to someone else. If you have a press page, it’s important to keep it up to date, as an out-of-date press page that hasn’t been updated in years hurts you more than helps you since press mentions spiral up or spiral down quickly. The more you seem to be mentioned, the more you get mentioned; the less you seem to be mentioned, the less you get mentioned. Every bullet and mention adds up — delegate this to keep it fresh. Don’t forget to build an email workflow, since you’re more likely to be notified by email that a piece that mentions you has been published rather than via public mechanisms. People are likely saying kind things about you and your offers many times per week. Saying thank you is a given — but collecting and displaying the kind words should also be a given. A team member can automatically catch the words and get them where they need to be if they’re public, and you can forward email testimonials. Positive mentions and praise let you know what you’re doing is working; informing your audience about positive mentions and praise makes that positive feedback work for you. While you might be humble and hesitant to brag on yourself, your audience and supporters want to hear about your good news because, in some respect, it’s their good news, too. Assign this task to a team member and they can make sure the mentions and praise get put back out in your email marketing, blogging, and social media updates. My goal with today’s post was to take what you’re already doing and show you how you can break it up and hand parts of it over to someone else. It takes a little bit of work and setup to build the workflows, but thirty minutes of building one will pay you back in hours every week for years to come. Whether it’s one of the workflows above or another one you’re inspired to create, take thirty minutes to build the workflow and start the process of handing it over by the end of the week. There’s no time like the present to build a better future for yourself and your audience.